With the first half of the season focused on the Paladins returning to Earth, and the second half of the season focused on defending it, Voltron season 7 has entirely changed the game. Voltron season 7 returns to the 13-episode format, and I’m very glad they did. Aside from the fact that I found the shorter seasons to feel choppy and have pacing issues, they probably would have split the season at them returning to the Milky Way and hearing Sam’s distress call, and I just wouldn’t have been able to deal with that cliffhanger for too long. Overall, I found this season to be well done – a nice coherent story arc with little mini-arcs along the way, good action, and some excellent character development. For the most part, Voltron season 7 dealt with the return to Earth and the counterattack against the invading Galra force, led by Sendak. While each episode had moments of levity, only “The Feud!” really broke up what ended up being a pretty dark season. I usually try to go episode by episode when I do these reviews, but this time I think I’m just going to concentrate on a few key things, so this will probably be one of my more rambly reviews. 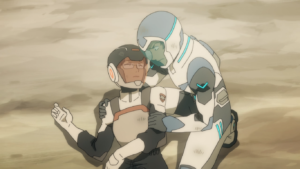 I try to avoid ship talk in my reviews, and I try not to let my ships color my opinion of something, but damn it’s hard to watch this season and not look at all the Sheith (Shiro/Keith). “A Little Adventure” was primarily a flashback episode devoted almost entirely to Shiro and Keith’s relationship. This is where we meet Adam, Shiro’s ex-boyfriend (who is fridged later), but really it’s all about Keith and Shiro and how important they are to each other, which is a recurring theme throughout the series and why Sheith has been the focus of so many articles since Shiro’s sexuality was revealed. Whether or not they actually go there remains to be seen, but Joaquim dos Santos and Lauren Montgomery have written one of the most beautifully romantic relationships I think I’ve ever seen (Keith saving Shiro literally bookended the season), and I have to believe they’ll treat it right in season 8. You don’t do something that well-written by accident. Now, I don’t think Adam was right for Shiro, and I didn’t want them to get back together when everyone returned to Earth, but I’m not a fan of the fridging. Mostly because I feel like now Shiro doesn’t get any real closure from their breakup, and I tend to disagree with fridging on principle. It was hard for me to feel anything at his death, though, because he’s not a fully fleshed out character. He’s on screen for half a heartbeat, and considering how good of a pilot he was and how many people from the Garrison died, it just makes sense that he would have died fighting. I mean, it’s a war. But Shiro still exists and is just, you know, walking around being gay and awesome. An amazing thing about Voltron season 7 was Hunk’s development. I love Hunk, and I’ve long felt he’s been overshadowed by the other Paladins for the past few seasons. He does get little moments scattered through various episodes, but I don’t think he’s really had his own story for a very long time. His brief flirtation with diplomacy in season 6 was a nice start, and that will hopefully come into play in season 8, but it was really great to see him have so much going on in season 7. “Know Your Enemy” was a great Hunk episode; I especially loved his talk with Keith, because I don’t think those two have every really interacted one-on-one before, but also because Keith’s “bravery is going on in spite of fear” is the perfect explanation of why Hunk is a great Paladin. He’s constantly terrified, but he does it anyway. Everybody had some pretty badass scenes at some point in Voltron season 7. There were a lot of badass scenes in “The Road Home” – Hunk, Krolia, and even Romelle each had a pretty shining moment. Honestly, this was a pretty great season for everybody, both as individuals and as Paladins of Voltron. 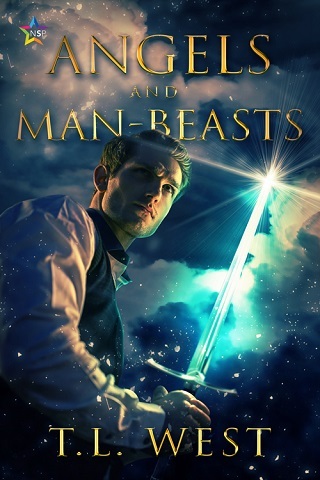 I mean, the psychic connection to their lions, and managing to fly them without being physically present? 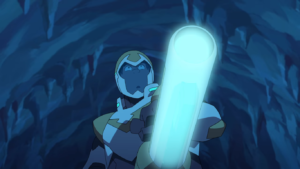 At one point Keith literally willed his Bayard into his hand. Allura did something pretty awesome with her magic when they were all frozen in “The Ruins”. I don’t like that one of the most powerful beings in the universe designated Lance as “the dumb one”, but I thought he had a really great arc this season. I enjoyed getting to see him reunite with his family, and I loved his interactions with his sister. Keith really stepped into his role as a leader, and “The Journey Within” went a long way towards solidifying the bond between the Paladins. 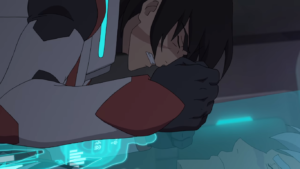 I think Keith has really only connected with Shiro and not with the other Paladins, so their unification and unwillingness to leave anyone behind was particularly satisfying. Plus, what a big season this was for Shiro! He’s been through hell and back, and I’m sad that it seems as though he’ll not get the chance to be a Paladin again (was the official Twitter trolling when they tweeted that the white lion wasn’t done with him? ), but he got a new disease-free body, a new floating arm, and somehow made his own Voltron, of which he is now Captain. Not to mention, he got to face off against Sendak again, and he faced him bravely and kept toe-to-toe with him. Yeah, Keith had to come down at the last second and save him, but then Shiro made his own Voltron and saved the day himself. After everything he’s been through, this was probably the closest to rainbows and puppies he’s going to get. But, as I said before, Voltron season 7 really changed the game. Right from the beginning, in “The Road Home”, we got the sense that something was up. The team encountered Galra ships that used unfamiliar weapons and non-standard tactics, which confuses everybody. Either the different factions have developed completely different technologies and battle strategies, or there is something more going on. 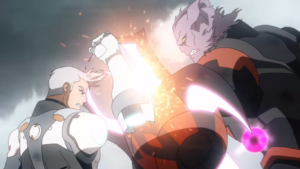 This is confirmed in “The Lions’ Pride”, the two-part finale wherein after the Galra fleet is destroyed some giant evil robot Scyther shows up and nearly wipes out everyone – then it turns out that its power source is an Altean. We know that the Alteans are missing, and Haggar was nowhere to be found this season. I have to believe these are all connected. The breakup of the Galra empire into warring factions is fascinating and I wish we’d gotten to see more of this. 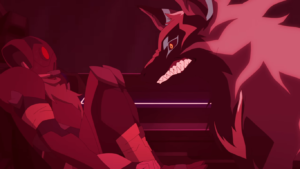 The season 6 promotional material focused heavily on the Galra civil war, and then season 6 itself largely glossed over it. Now Voltron season 7 is sort of doing the same thing. We do have “The Way Forward”, where we see that Zethrid and Ezor have become warlords while Acxa has decided to be a rebel. I feel that Acxa’s change of heart has to do with honor; she was unquestionably Lotor’s most loyal follower, but he turned out to be not what she expected. Meanwhile, here is Keith, who acts respectfully towards her even though they are enemies, and she responds with equal honor. That’s why she never kills him when she has the chance and that’s why she’s fighting now. 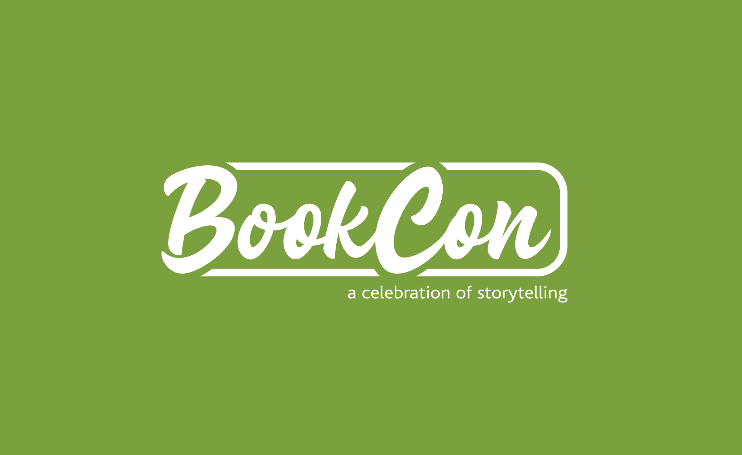 Lotor was wrong, but maybe Keith – and Voltron – are right. 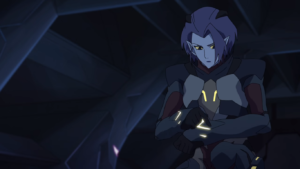 And I’m not sure where I stand on my theory that they’re somehow related – Acxa has met Krolia and I figure Krolia would know – but I still believe she could also be half-human. Then, of course, there’s everything that happened on Earth in the years it’s been since Voltron disappeared. 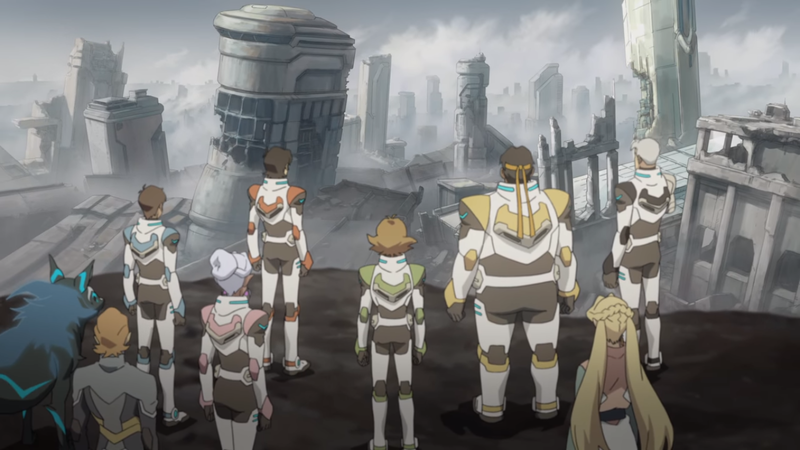 Voltron season 7 had two episodes – the two-parter “The Last Stand” – that were almost entirely without the Paladins. Instead, we were treated to a long flashback detailing what transpired after Sam returned to Earth. Aside from giving us the background we need so that we’re not confused as hell when the Paladins finally make it back, I do believe this was meant to be setting up possible spinoffs. I have to say, as interesting as it was to see what happened – to see more of Iverson, who turned out to not be that bad of a guy, to meet Lance’s sister Veronica, to see how Sam worked to integrate Earth and Altean technology – I didn’t particularly care for any of the new characters (except Veronica, she’s awesome). However, I will go into battle for Colleen Holt. The last two episodes of Voltron season 7 do a stellar job of setting up season 8. From what I can tell, Earth is going to be Voltron’s new base, with Atlas acting as the new Castle of Lions. This means that Shiro can stick around, as Captain of the Atlas, as the Paladins presumably take the fight to Haggar. After all, pretty much all of the important members of the Voltron Coalition are now on Earth (Shay! Yay! Matt has a ponytail! ), as well as what remains of the Blade of Marmora. Haggar and the vanished Alteans are the only missing pieces of the puzzle. I couldn’t help but notice all the cinematic parallels this season. “The Journey Within” had a huge Gravity vibe. Stealing a Galra cruiser to sneak past the fleet in “Know Your Enemy” reminded me of Independence Day. The weapon in “The Lions’ Pride” was a lot like the Romulan drill in the Star Trek reboot. “The Lions’ Pride” also had giant robots fighting a la Transformers. How the hell do you just casually drop in a World War III mention and then GIVE ME NOTHING ELSE? I’m kind of amazed they never made a new credits sequence. EZOR/ZETHRID? DON’T MIND IF I DO. A brief list of things that are everything: Keith and Krolia’s relationship, Coran narrating his adventures, Sam using Altean swear words, the fake commercials from “The Feud!”, Iverson apologizing to Keith. 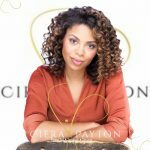 As much as I enjoyed “The Feud!”, I found its placement within the season odd and a little bit jarring. All in all, I think was a pretty solid season. I’m happy that it’s back to 13 episodes, although it is upsetting to realize there is only one season (13 episodes) left of Voltron. The score this season was absolutely amazing, possibly better than it was last season, and I loved last season. There is so much that I loved about Voltron season 7. Were there a few disappointments? Sure. But on the whole, I’m pretty pleased with how things turned out. 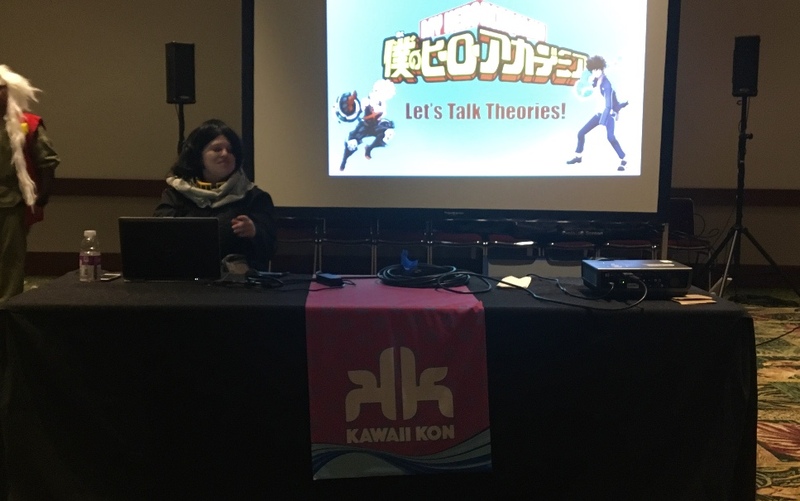 Previous:Does Voltron Legendary Defender Season 7 Deserve The Queer Representation Points It Wants?